Last night we tagged a Duke Energy office with words “James Marker, #NoSabalTrail.” This was done in memory of James Leroy Marker, who was killed by Florida police after using a high powered rifle to sabotage the Sabal Trail Pipeline. Duke Energy is heavily invested in this pipeline and is therefore complicit in James Marker’s murder. This fracked methane pipeline threatens unique ecosystems associated with the Floridan aquifer, including countless rivers, lakes and streams and the associated flora and fauna. Though this was but a small act, it serves as a reminder that pipeline resistance isn’t limited to construction sites or public rallies. Vengeance for James Leroy Marker! Down with the pipeline and its world! On Sunday, 30 October 2016, nearly 40 Bloomington community members gathered publicly to build solidarity in resistance to the Dakota Access Pipeline (DAPL). DAPL is being built to carry crude oil from North Dakota to Illinois, crossing under the Missouri River and through land that was guaranteed to the Sioux Native American community in the 1851 Fort Laramie Treaty. Pipelines often burst and leak oil into natural water sources; DAPL endangers clean water for nearly 10,000 individuals. Participants expressed their support of ongoing resistance to DAPL. We shared updates on materials collection and fundraising to support the struggle through the harsh North Dakota winter, while also laying plans for spreading solidarity in the event of further state raids. 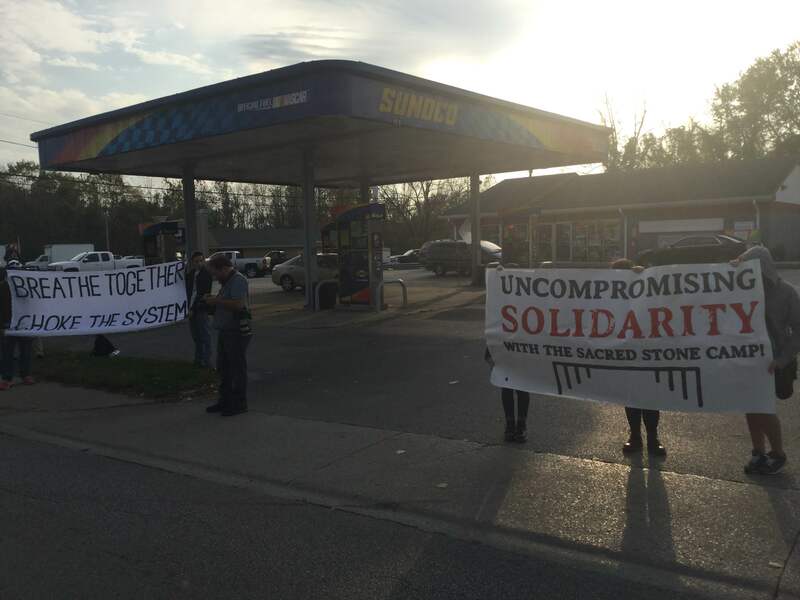 The assembly concluded with an action at the Sunoco on south Walnut in response to Sunoco’s hefty investment in the DAPL project, through its parent company Energy Transfer Partners. We picketed the station and blocked one entrance briefly. By demonstrating, we hope to spread awareness of the struggle and the repression at Standing Rock, and make sure that those profiting from the pipeline know that they will face consequences for jailing and injuring water defenders. Resistance will take many forms and spread in the coming weeks, as the construction contractors approach the river and the police ramp up their attacks. As you all have probably heard, the police launched a sustained and violent attack on the Oceti Sakowin camp at Standing Rock last night. Here is some coverage: https://www.unicornriot.ninja/?p=10476. An emergency solidarity gathering has been called for this Sunday at 3 pm at the intersection of Grimes and the B-Line (next to the Center for Sustainable Living offices/toolshare). Rubber bullets, military vehicles, exploding beanbags, and LRADS were all deployed against the water protectors, and this level of provocation cannot go unanswered. The 141 protesters who were arrested are also not being offered bail. So we want to convene a discussion and settle on a plan of action to make sure we don’t leave Standing Rock isolated at this crucial moment. For context, I-69 (also known as the NAFTA Superhighway) is a hugely unpopular interstate highway that, after years of delays due to organizing, sabotage, casualties, and bureaucratic ineptitude, is finally being expanded through Bloomington. The development will undoubtedly affect nearby aquifers and forever change the environmental and social landscape of our region. In total solidarity with the Lakota rebels: Against the black snakes and their world! 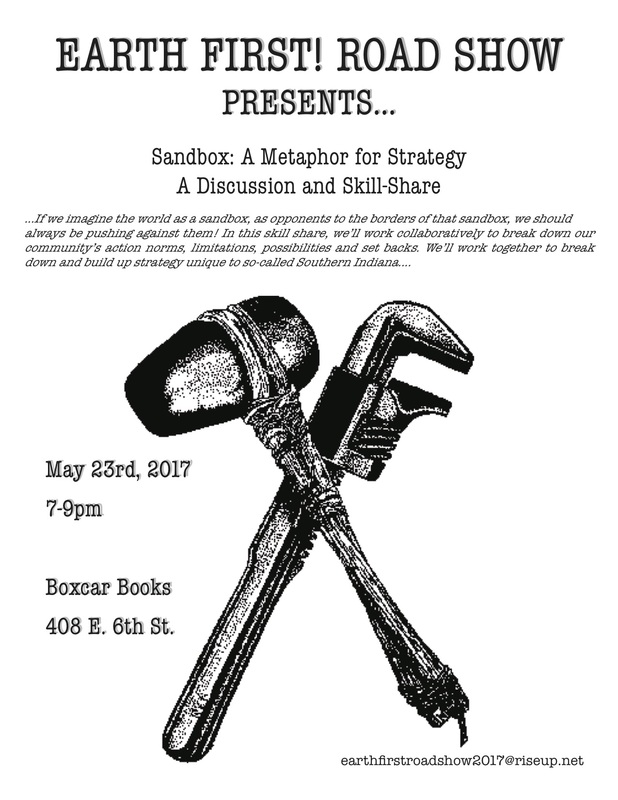 Saws, drills, sledgehammers, mallets, mattocks, and any other tools helpful for encampment infrastructure are welcome. PLEASE EMAIL glenncartertoolshare@gmail.com TO ARRANGE A TOOL DONATION DROP. We have made contact with the camps and they will hopefully be sending us a specific list, in the coming days. For now, check-out their donataion-request lists, posted below; however, please note that we can only accept donations of tools and hardware.